CONVOY — Crestview was riding a wave of disappointing losses as of late, falling by one run in several games. But the Knights bounced back and run ruled fellow Northwest Conference team, Bluffton, 17-2. It was a relatively calm game for the first three innings. Crestview held a modest, 5-0 lead over the Pirates. This was thanks to a three run first, fueled by hits from Griffin Painter, Korbin Hartman and Riley Saylor. And, also a two run third, fueled base hits by Painter and Brody Brecht. Bluffton even snuck back into the game, with a two run top of the fourth. The Knights plated 12 men in the bottom in the fourth inning and then recorded a one-two-three inning in the top of the fifth to complete the run rule. In the fifth, Crestview, sent 17, yes, 17 batters to the plates. The Knights had seven hits, and two walks. Bluffton committed five errors in the inning as well. Kole Small and Wilson led the Knights with three RBIs each. Wilson was the only Knight with three hits, while Painter was the only one to score three times. 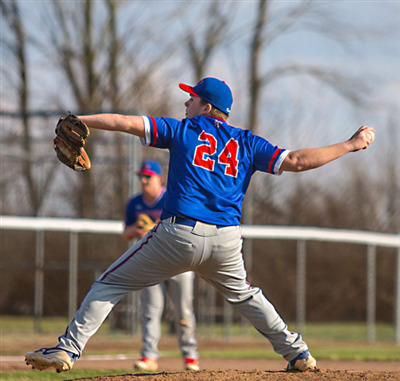 Every starter had a hit and scored a run for Crestview on Monday. Kole Small threw an abbreviated complete game, allowing two runs (neither earned) on just one hit. Small sent eight Pirates packing on strikes. Crestview will play Allen East in NWC action Thursday.